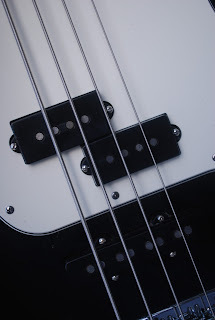 Today we are looking at a cool ESP Vintage Four bass guitar. The Vintage series was introduced in 2007, and it was not a very hot seller for the company. This was probably because they were just too expensive, plus they were saddled with an overdone phony relic look. But in today’s used market they are pretty cheap, and the appearance is the only major gripe I have, as it is a great bass. For starters, this one is a real live ESP bass, that was made by craftsmen in Japan, not an LTD model put together by little kids in some third world country. And every ESP bass (or guitar) I’ve had has been a great player with no cosmetic or functional flaws. This Vintage 4 is no exception; it is a super smooth-playing bass, and the build quality is first rate. The neck is spot on with perfect fretwork and a great action, even eight years later. The body is alder, and it has the traditional Precision Bass shape. As I said, it has a relic look, which some genius in the design department decided to cover in clear lacquer. It looks very contrived. The hardware is very good, with a Gotoh high-mass bridge and vintage-look tuners. ESP carried over the trussrod adjustment at the base of the neck and no cutout in the pickguard to access it. Again, pure genius. The maple neck also gets the relic treatment, but it is still very cozy. I like the ESP inlay at the 12th fret, which hearkens back to the ESP 400 models that inspired this bass. The electronics are first-rate, as ESP sourced Seymour Duncan P and J pickups. The wiring and joints are very neat, and the cavity is nicely coated. The controls are two volume pots and a master tone control. The Vintage 4’s electronics work well, too, but then again I have always been a sucker for P/J-equipped basses. I find it easy to get any tone from Motown thump to gnarly loud fingerstyle, and everything in between. This bass can do most anything you need from a 4-string bass, if you can get past the way it looks. This one was well cared for and the relicing has softened a bit with age, so it does not look quite as bad. 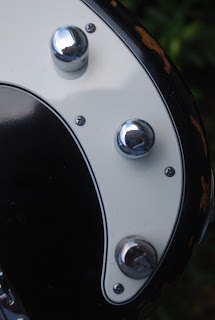 These basses originally shipped in a black ESP deluxe tolex hardshell case, which was to be expected in this price range, and this one still has it (though it is a bit worse for wear). That initially high price was probably the real deal-killer for these basses when they came out. Though the dollar is strong now it was very weak in 1989, and ESP needed a lot more dollars to make the same amount of Yen. The list price for the ESP Vintage 4 bass was a nut-shrinking $2499, and I did not see new ones for any less than $1499 online. That was Sadowsky Metro series money at the time, so you can see why ESP had some trouble moving these. There were a lot better values for your money at the price point if you wanted to buy something new then. But now they are the same price as a used Fender Japan P-bass, which makes them a true bargain. If you ever see one, give it a try – trust me!